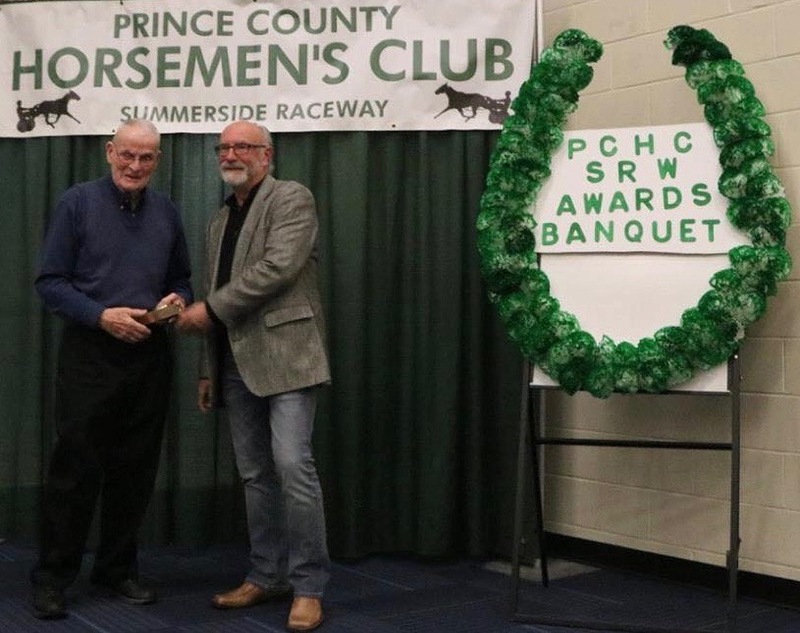 Submitted by Kathy Clow: My father, Paul McKinnon, was honoured at the Prince County Horseman’s Club Annual Banquet recently and was awarded The Lifetime Achievement Award. Of course, he did not know, and even though Mum had put out a suit for him to wear, he said, he was not wearing it as he did not need to put airs on for the Summerside Crowd. Dad always loved driving and racing in Summerside, and during his years as Director of the USTA, he helped a lot of horse people and made many lifetime friends. CONGRATULATIONS DAD for being acknowledged for the work you did in the betterment of the Sport of Kings! We along with many Island Horsemen and women are very pleased of this recognition for Dad. He worked extremely hard to improve the harness racing industry on Prince Edward Island. Editor’s note: On behalf of the community, we also congratulate Paul on this wonderful achievement. PEI Junior Women’s Team back from National Championship in Victoria, B.C. 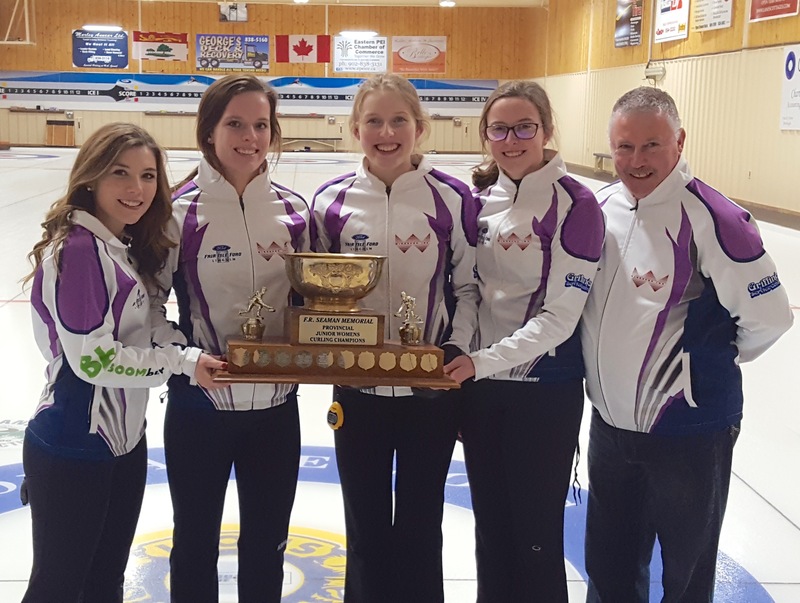 We followed up with Cornwall Curling Club’s – PEI Junior Women’s Curling Champions to find out about their experience at the National Championship in Victoria, B.C., January 21-29. The team includes Second: Breanne Burgoyne (Clyde River), Lead: Rachel O’Connor (Charlottetown), Third: Kristie Rogers (New Haven) and Skip: Lauren Lenentine (New Dominion). Lauren Lenentine gave us the following update on behalf of the team. After competing at Nationals, one word that could describe our emotions would be “proud”. We went to B.C. without any expectations but with a goal to make the Championship Pool. Once we achieved our goal, it was an incredible feeling. We were the first women’s team from PEI to make the championship round since 2012. That year, Sarah Fullerton finished 8th. This year, we finished 7th. We received many messages from home saying how proud everyone was, and those emotions transferred over to us. The final result in the championship game was Alberta defeating Ontario 5-3. Our biggest highlight on the ice would be beating B.C. and the reigning World Champions, Nova Scotia. It was a surreal moment. We all realized that we can compete at this level and we are not out of place. Off ice, interacting with fellow athletes and sightseeing were our two favourite things. Victoria is a beautiful city, and it was nice to feel warm air for a change. We visited a coastal town called Sooke and it was breathtaking. As for meeting curlers, we made friends from across the country. In the evenings, we would all meet in the Player’s Lounge and play board games and ping pong. Some of our favourite memories were made off-ice!! During the eight days of competition, we played 10 games together as a team. Most days we played two games, but some days we only played one. After the tournament concluded, we all took part in a mixed doubles tournament. We were paired with a male player and coach from another province/territory and we competed for top. I was paired with the lead from Northwest Territories. Unfortunately, all four of us were eliminated in the first round, but it was still an amazing experience. Staying in “the zone” wasn’t a difficult task. As soon as you walk into the arena/club, you have a feeling that is indescribable. No matter how sore or tired you were, it all disappeared once we were on the ice. We already knew most of the teams from the Atlantic provinces, but we met lots of new people from western provinces. One thing that I gained personally from this experience is patience. We saw various strategies that differed from our own and by times it was frustrating. But I learned that if you wait, the right opportunities will come. Another thing we learned was how to preserve ourselves. We learned the importance of proper nutrition, hydration, and rest. These three things were crucial during the long week. After what we just experienced, our goal next season is to win Junior Provincials and return to Canadian Juniors. We plan on travelling and competing in a few more events throughout the season to prepare for this. Having our family and friends there as support made the experience even more special. No matter where you were, you could always hear the PEI chants! Being able to look into the stands and see all the familiar faces is a really great feeling. And without a doubt, we had the best fans!! I know their experience was just as amazing as ours. Pat Quilty, our coach, won the Asham Coaching Award. This award is voted on by fellow coaches, and it is based on sportsmanship. Although I may be biased, I believe Pat was the best choice for this award because of all the hard work and dedication he has put into our team in the past eight years. He always shows respect for other curlers and coaches. It is very well deserved. I love that every time I tweet about @teamlenentine, most of their family members favorite it. Gotta love those Islanders. Clyde River’s Breanne Burgoyne will be representing PEI’s Junior Women’s Curling on Team Lenentine at the 2017 National Junior Curling Championships in Victoria, B.C., January 21-29. Her teammates include Rachel O’Connor (Charlottetown), Kristie Rogers (New Haven) and Lauren Lenentine (New Dominion). Breanne, Lauren and Rachel have curled together for nine years. This year, they welcomed Kristie Rogers to their team. Coach Pat Quilty has been with them from the beginning and has spend countless hours preparing them for this achievement. In April 2016, they ended their season by winning the Atlantic Under 18 Championship in Halifax. As they entered this curling season, their goal was to represent PEI at the 2017 National Under 21 Championships in Victoria. They worked hard, on an off the ice, through the Summer and into the Fall. They travelled off island on numerous occasions this past Fall to compete with some of Atlantic Canada’s strongest competitors, including against the Nova Scotia team that won the world championship in 2016. They were determined to meet their goal and were focused on one outcome at the provincial play downs held in Montague over the Christmas holidays. Their dedication paid off. There will be a Meet & Greet Fundraiser for the team at the Cornwall Civic Centre, 29 Cornwall Road on Saturday, January 14th, 5:00-7:30 p.m. (storm date – January 15th). Chili and snacks to be served. Donations to cover expenses will be graciously accepted, and a Gift Basket will be drawn for on January 17th. For any additional information, please contact Jennifer Lenentine at jenlenentine@hotmail.com or call (902) 393-2625. Make sure to follow @TeamLenentine on Twitter. The following story is the history of North River Rink which Ronnie MacKinley presented to an audience of almost 100 at the Clyde River History lectures on February 20th. To listen to Ronnie’s full presentation which includes many stories, you can link here. The recording also features Neil Shaw who, along with a group of businessmen, managed the rink after Hollis Corney. Sterling MacRae added a few stories of his years of hockey at the rink. Many of the alumni players attended this Clyde River lecture and they brought along memorabilia and photos which we scanned and collected on this site. Just click on the album cover photo and you can advance through the extensive collection. Many of the people are identified in the photos, but for those that are not, we welcome you to add comments to let us know who you recognize. If you have any other photos that you wish to add to the album, please send to vivian@eastlink.ca. Click on photo to see the full album of photos and memorabilia. During the 1940s, the North River area was lacking an ice rink. There was a converted factory in Cornwall that served as a rink but it has fallen into disrepair and an outdoor rink was constructed. Fultie Warren, a local farmer and businessman, felt that an outdoor rink was not reliable to promote quality hockey, so in 1948, he and Bruce MacKinley decided to build a rink in North River to serve this and all surrounding communities. Fultie, his father and brother operated a sawmill in Warren Grove and just needed a large stand of trees to provide adequate lumber for the truss rafters. With the help of Paddy McGee, they found a tree lot in Emyvale and Fultie signed a contract on a stump to cut four acres. The cost was $270. In the winter of 1948-49, Fultie hired group of 30-40 men to cut the lumber, haul it out through John Cusack’s field and pile it on John F. McQuaid’s property. In the Summer of 1949, the lumber was moved to the mill for sawing and then over to the construction site. They decided to build the rink on the corner of Bruce MacKinley’s farm at the corner of what is now the Trans Canada Highway and York Point Road. Heber Campbell took the job as main carpenter and a crew of over 30 men worked on the site during the fall of 1949. The men cutting the lumber and constructing the rink were paid either 50 cents an hour or they took shares in the rink at $10/share. Fultie kept track of all the hours from the woods to the sawmill to the rink to make sure all the men were fairly paid. When it was time to install the truss rafters, they hired Douglas Bros. & Jones who had the equipment to lift the huge rafters into position. Apparently, the process was rushed and no one on the site had worked with such huge rafters. Just as the workers were about to stop work one evening, eleven rafters came crashing down. It was a miracle no one was badly injured. When the roof was finally completed in early January, Fultie and his crew had to wait for cold weather before they could flood the rink. They were having a mild winter and it was impossible to level the ice surface due to mud. On January 8th, the temperature took a sharp drop, and Fultie flooded the ice surface with a foot of water before he had it level. The following night, on January 9th, the North River Rink opened for business. For the next 22 years, Fultie and Bruce spent many cold hours operating the rink. Maintaining the rink was intense and cold work. They were kept busy into the wee hours. In the beginning, they pumped water from a pond on the MacKinley’s farm, located north of the rink. However, when the Trans Canada highway was constructed between the rink and the pond, they drilled two wells to supply the rink. The owners not only had to maintain the ice, but they had to operate the ticket box and canteen. North River rink was open six days a week and closed on Sunday. The hockey season ran from December until May. Besides running the rink and counting money until the wee hours of the morning, Fultie had a dairy farm to manage and he was president of the “C” league where he helped to organize the “school league” minor hockey program. The revenue generated from the rink was shared between the teams and owners on a percentage basis. All the profits either flowed back into the operation or paid out in dividends to the shareholders. Fultie said his only pay cheque from the rink was during the last year; it was $100. After 22 years of managing all hockey activities at North River Rink, the owners decided to sell the rink to the local communities. When the deal fell through, they sold the property to a Hollis Corney, a shoe retailer and entrepreneur. Hollis controlled all aspects of the business. He was a familiar figure with his long coat and overshoes. He took money at the door, worked in the canteen, and drove the zamboni. Hollis modernized the rink by installing artificial ice. He brought in the first zamboni to PEI. By 1975, there was seating for 1400. Ronnie recalled during the early days before the expansion, there would be more than that watching a game in the small rink and he can’t imagine how they all fit inside. The farmers would stop grading potatoes to take in the game. Hollis rented out the ice for $22/hour and was busy as the only other rinks in the area were UPEI and the Forum in Charlottetown. As well as minor hockey, Hollis hosted High School hockey. The Kennedy’s – Forbie, Jamie and Jake – offered a hockey school program each Spring. Hollis introduced Junior Hockey and for several years, the Junior North Stars were a powerhouse and fan favourite, packing the rink. Hollis also hosted skating events for the general public and local schools. In the off season, he organized roller skating. Later he held wrestling matches. After running the rink for thirteen years, Hollis leased the rink to Virgo Enterprises a community business group. Neil Shaw told the story of when they took over the rink. We would like to make a list of all the teams that played at North River Rink. We will begin a partial list below, but we want to hear from you to help us complete the list. Also, send any photos you have. Please email vivian@eastlink.ca. We welcome you to leave comments below of your memories of North River Rink. Ronnie MacKinley will join us in Clyde River next Saturday, February 20th at 1:30 p.m. to talk about the days when all the communities in the area went head to head in the game of hockey. All are welcome, and we extend a special invitation to those who played on the teams in the 1950s and 60s to join us. Make sure to take along any memorabilia you have to display for this occasion. We are bringing in extra chairs, as we know it will be popular. However, you may find yourself falling off your chair laughing when natural storyteller Ronnie gets wound up. I found a feature on the Island Narratives site that talks about the interesting history and community spirit that saw the North River Rink constructed in 1949, opened in 1950 and serving the area for many years, link here. See you next week at the Riverview Community Centre in Clyde River. Refreshments will be served. January is upon us, and so far, so good. We are having a lovely winter, but we thought that this time last year and all that changed come the end of January. Within three weeks, it looked like those legendary winter heritage photos. Well, we in Clyde River do our best to make the winter more sociable by hosting the Clyde River Lectures, and this year, we decided to go a little beyond the boundaries of Clyde River and move up Hampshire and Emyvale way and down to North River. It only makes sense considering how closely knit our communities have been over the years. Just check any of your ancestors’ diaries and inevitably you will find that they were visiting some sort of relations in those communities. Their visits could very well have been documented in The Guardian under “Clyde River Notes.” Here are the presentations we have lined up. Saturday, January 23rd – 1:30 – 3:30 p.m. – Leonard Cusack – A Magnificent Gift Declined: The Dalton Sanatorium of Prince Edward Island 1913-1923 – Leonard’s presentation will be based on his book by the same name that he wrote in 2009. His writing garnered “Publication of the Year” which was presented by the PEI Museum and Heritage Foundation. He will describe Island society in the early 1900’s and show how the health standards at that time encouraged the spread of tuberculosis. Leonard will explain why Charles Dalton built a sanatorium in Emyvale and how it operated as a TB hospital between 1916 and 1920. Over the course of his talk, he will explain the many bizarre twists and turns that led to the closure and the demise of this health complex. Leonard is a resident of Emyvale, a retired teacher and public servant. He was also a Sessional Lecturer for the History Department at UPEI for forty years and he specialized in Canadian and Island history. Leonard’s second book is entitled The P.E.I. Progressive Conservative Party 1770-2000 (2013). During our “Capturing Collective Memories” project last year in Clyde River, we came upon stories and photos that reflected the challenge and sorrow that many families went through that were touched by TB. Leonard’s important work gives us a greater understanding of that time. Saturday, February 6th – 1:30 – 3:30 p.m. – Verna Clow – History of Clow’s Store – Country stores were an important part of the fabric within Island communities over the years. Many did not survive, but Clow’s Store in Hampshire is still thriving. Verna will talk about the history of their store from the early days when Albert Clow first founded it. Her presentation will include photos of the store over the years and how they changed with the times while maintaining strong customer loyalty. She will share some of her favourite stories. Saturday, February 20th – 1:30 – 3:30 p.m. – Ron MacKinley – Hockey Talk – Memories of Playing at North River Rink – Ronnie will recount his memories of the early days when teams from local communities went head to head in the game of hockey. He will share stories of the rivalry and the fun. We welcome all those who played on the local community teams to attend and chime in with their stories, as Ronnie will likely be talking about you. 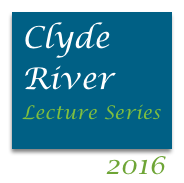 All our lectures take place at the Riverview Community Centre, 718 Clyde River Road, in Clyde River. We feature warm hospitality with coffee/tea and homemade treats along with tours of our large collection of artifacts and photos highlighting the history of the community. If you would like more information on our lectures, please contact vivian@eastlink.ca or call 902-367-1818. All are welcome to attend. Blois Beer got his start in hockey on the ice pond behind his home on the Bannockburn at age 5 and, this year, his Alberta team called the Wolf Pack won gold at the Canada Seniors Games. Blois’ work career has taken him from PEI to New Brunswick, Manitoba and for the last many years, Alberta, but his love for playing hockey has remained strong and it paid off. 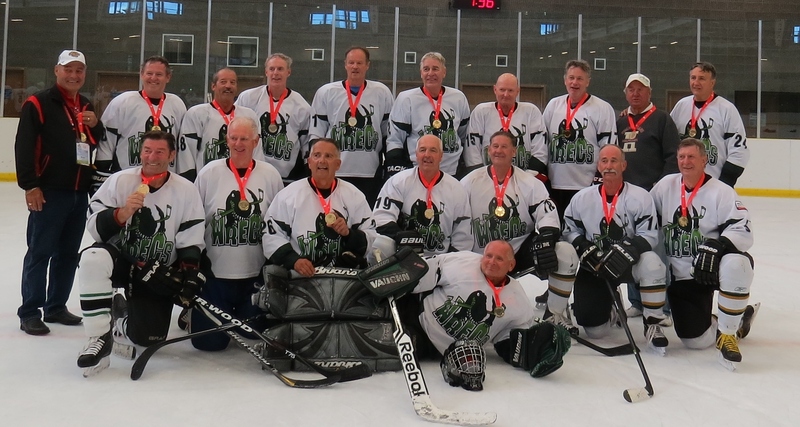 The lives of professional hockey players can be brief and they can be considered old in their early 30s, but hockey dreams at the Seniors Games live on. This is Blois’ third time at the Canada Seniors Games. Their team blazed through matches with Manitoba, Ontario and two BC teams and went stick to stick for the gold medal against Ontario, five games undefeated. Blois said that it was a great experience to be able to compete and meet participants from across Canada including those from PEI that he played with many years ago. Old hockey pals from PEI were Frank Morrison, Errol Taylor, Howard Ellis, Ken Kelly and Gerry MacDonald. PEI was short a couple of players, so Blois said his Alberta hockey buddies ended up playing with PEI. After childhood days on the pond behind his home, Blois played nearly every Saturday afternoon in winter on the dam in Kingston after morning games at North River Rink with the Kingston School team when they were ages 9-10. Each of the schools had teams but Clyde River didn’t, so Coach George Dixon invited Blois to play on the Kingston team. Blois went on to play with the North River Pee Wee team, North River Bantam teams, juvenile-midget level with Sherwood Mustangs, and then high school teams. At the junior level, he played with Sherwood Mustangs and then Summerside Crystals with coach Forbie Kennedy. At the senior level, he played with the Charlottetown Senior League and then Kingston Crystals in the South Shore Hockey League out of Crapaud. When his work took him to New Brunswick and then to the west, he continued to play in Moncton, Winnipeg, Brandon and now Edmonton. After winning Gold this year, Blois had knee surgery to repair a torn meniscus and clean up arthritis damage. He said if rehab and physiotherapy go well, he will be ready to compete in the 55 plus games in Lethbridge in February 2015. He has been to a couple of public skates already and his knee feels fine. He just has to build up muscle. In his early 60s, Blois will continue in the sport he loves for as long as he is able. He is not the only Islander of his kind in Alberta. John Warren, whose father Keir Warren owned and operated North River Rink, plays in the same 50 plus hockey league he does and he says it is great to talk to him a few times over the winter when they play against each other.